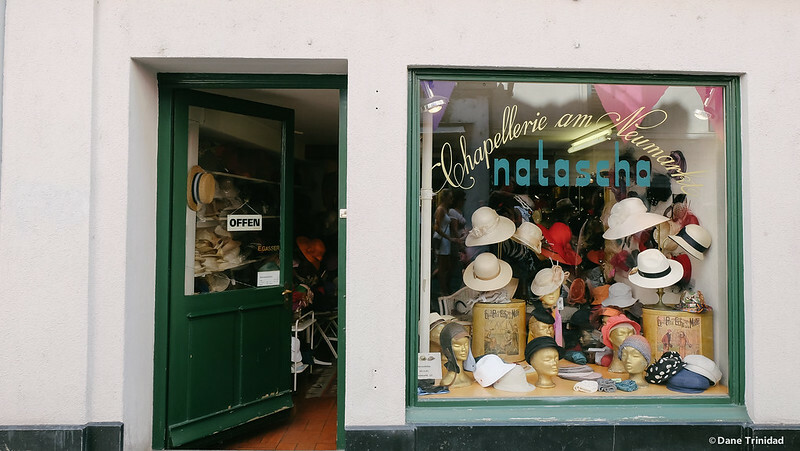 After a long hiatus, I’m back to share my Euro trips! 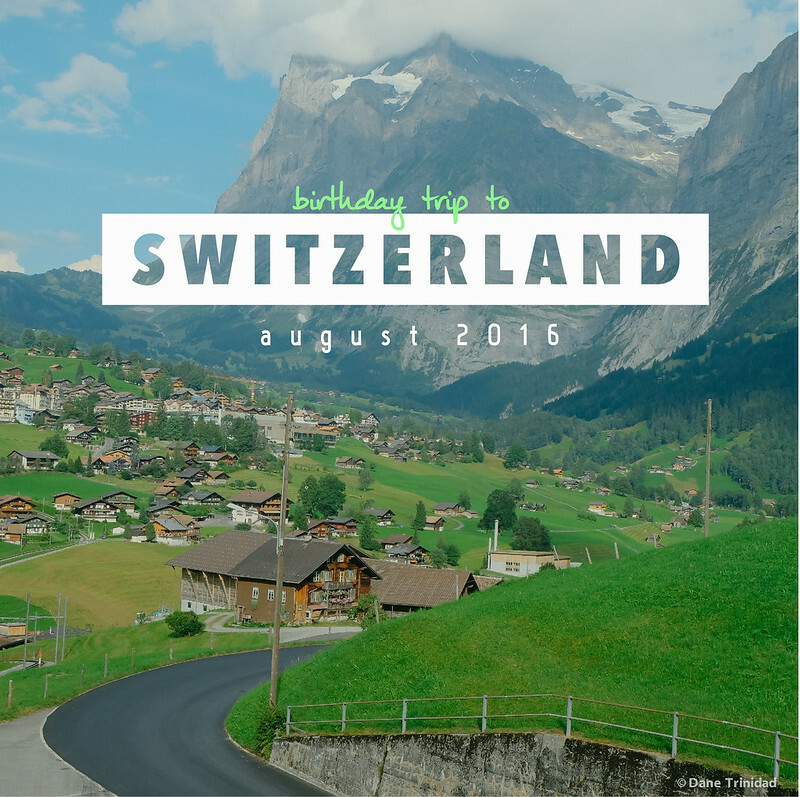 First off is my birthday trip weekend last August. I was actually confused where to go- Prague (again), Austria, or Zurich. These countries are the nearest ones from my place in mid-Franconia, but in the end, Zurich sounded more exciting. 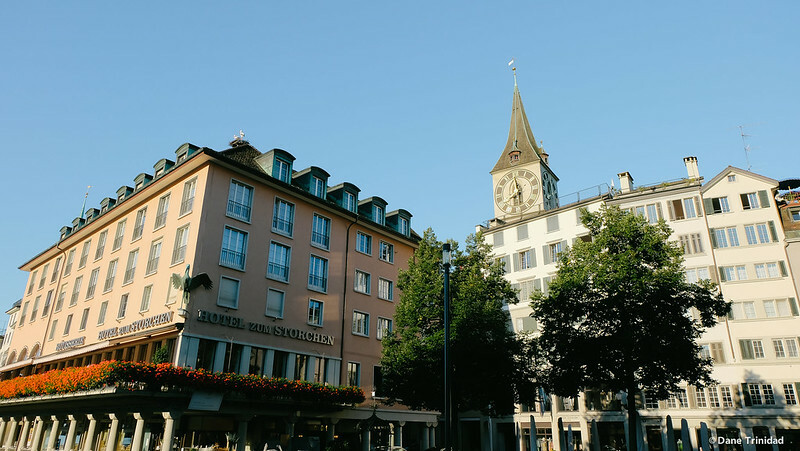 As you know, I recently moved to Germany (so I don’t have close friends right away), but I don’t want to be stuck in the hotel alone on my birthday- so I decided last minute (12 hrs before) to book an overnight bus to Zurich, Switzerland. It’s amazing how cheap an inter-country bus in Europe can be (22 Euros, one way, via Flixbus, last minute booking, 6 hour trip). 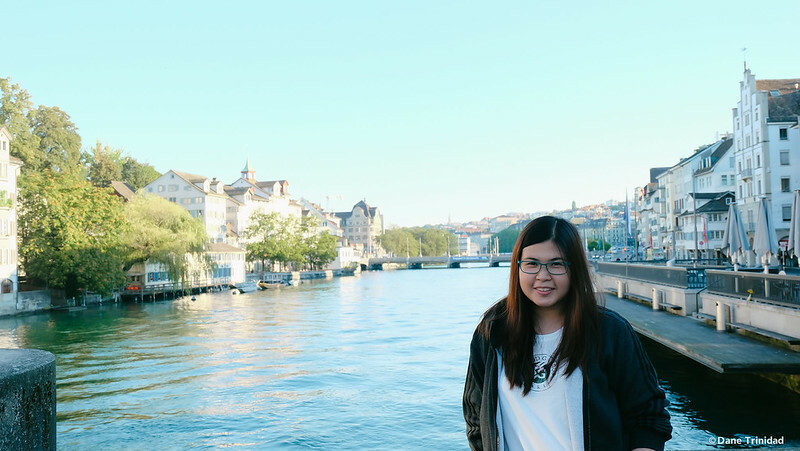 I left Nuremberg by 12 MN, and arrived at Zurich, Switzerland by 6AM. The hostel (Hotel Otter) I booked won’t let me checkin until 3PM, so I decided to leave my backpack in their reception first, then I had an early morning breakfast & photowalk along the Limmatquai river. 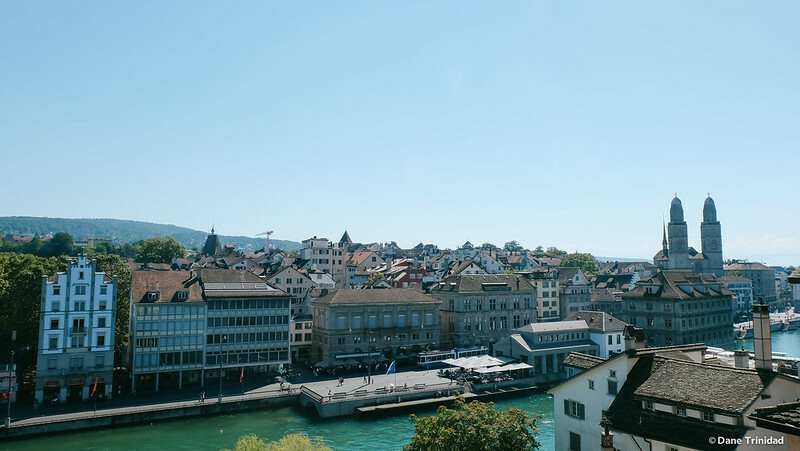 Just a note, you can’t really go on bottom rock budget trip in Zurich since the cost of living here is quite high as compared to other countries in Europe. 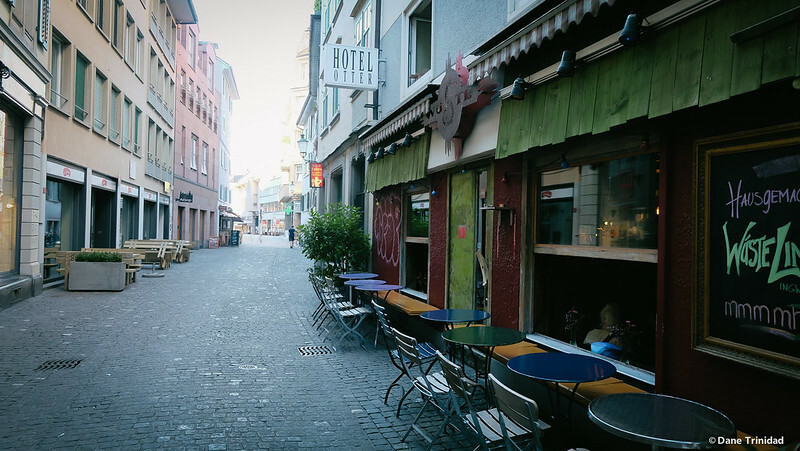 Other than budget hostels, you can also book via Airbnb as there are some nice and reasonably-priced rooms in Zurich. You can use my affiliate Airbnb discount link to save around 20 USD on your booking! 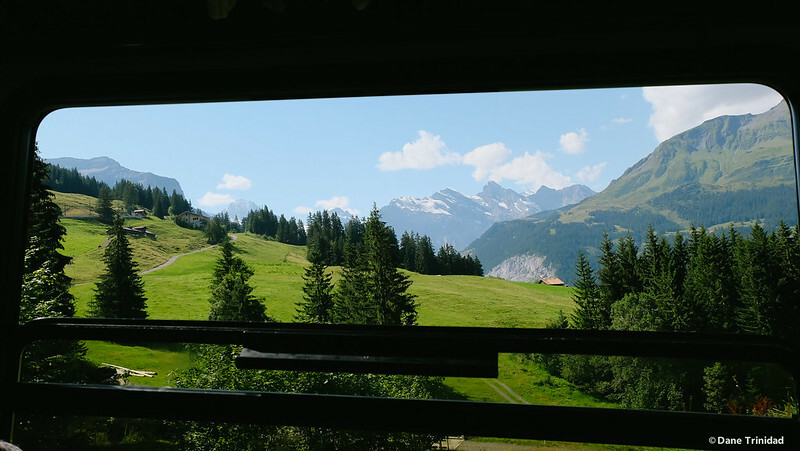 For other options, you can also check this helpful post by Hostel Geeks about Backpackers Villa in Switzerland (click here). I had a simple birthday breakfast in one of the cafes just in front of the river. While drinking my favorite drink in the world (coffee of course! ), I can’t help but feel grateful of all the blessings I have (so far) and will have (in the future). 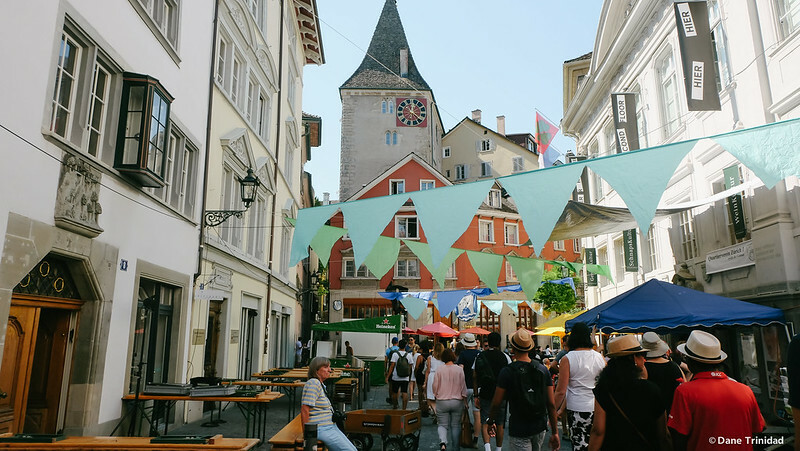 Life, definitely, has been very good to me, and I want to continually experience how magical it can be while retaining my simple joys in a trip – traveling in a budget, free photowalks, unlimited coffee, and happy moments with family and friends. 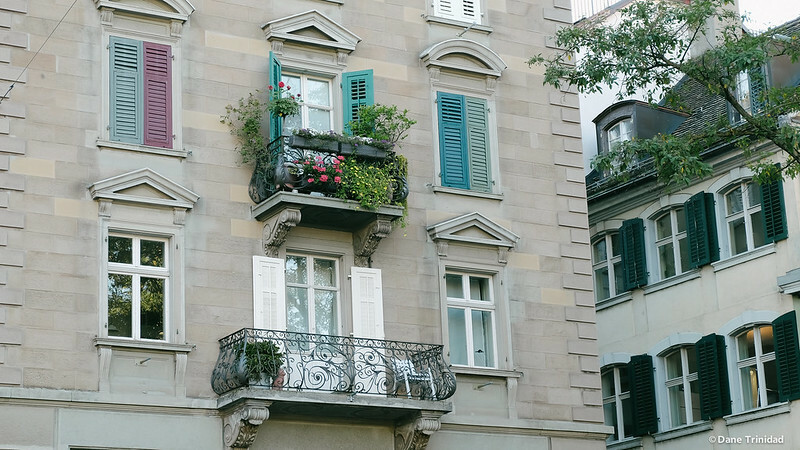 Balconies in Europe are generally colorful and adorned with flowers. I also decided to go on a photowalk along the main street. 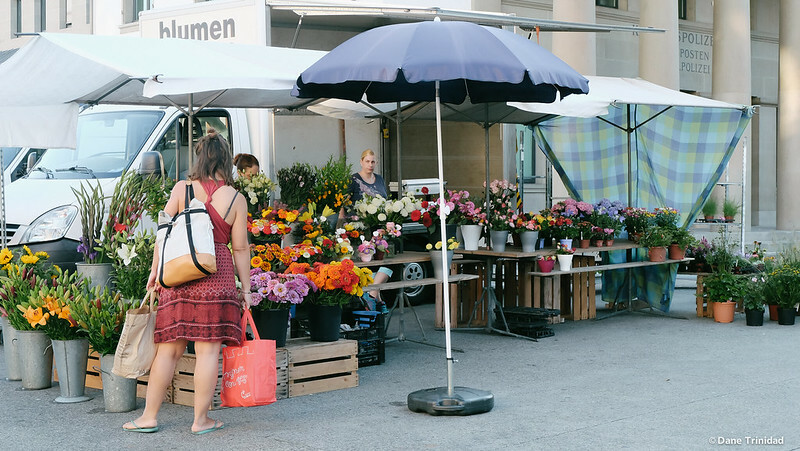 Since it’s a Saturday, there is a weekend market selling fresh vegetables, fruits, flowers, and different types of cheese. 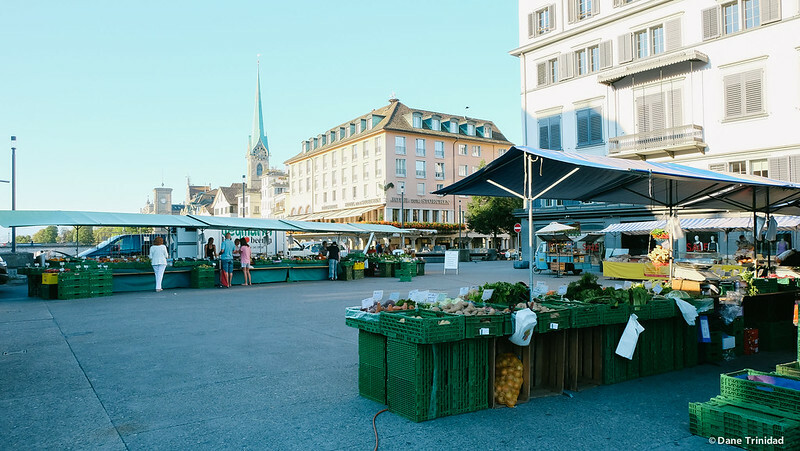 People of Zurich are also quite friendly because I’ve encountered several people offering help for taking photos. After around 1.5 hrs of walking, I dropped by at Starbucks to drink my favorite Teavana Lemon Green Tea (with lots of ice), and used their Wifi as well to gather the birthday greetings from my family and boyfriend. 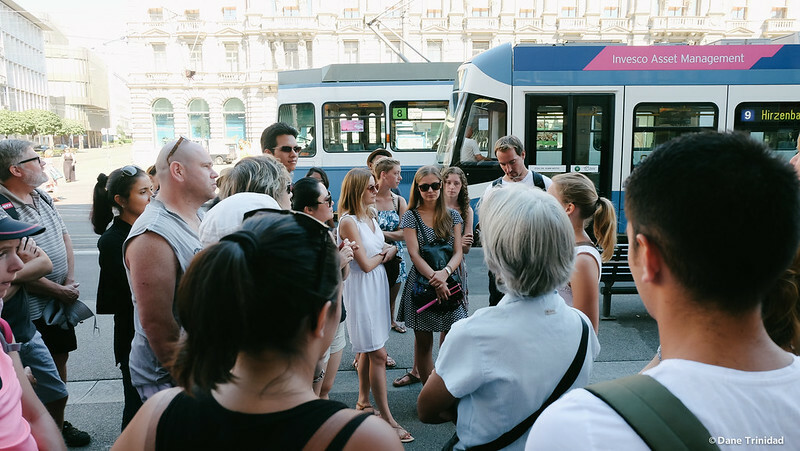 At around 10:30AM, I decided to walk towards Paradeplatz to join the free walking tour. 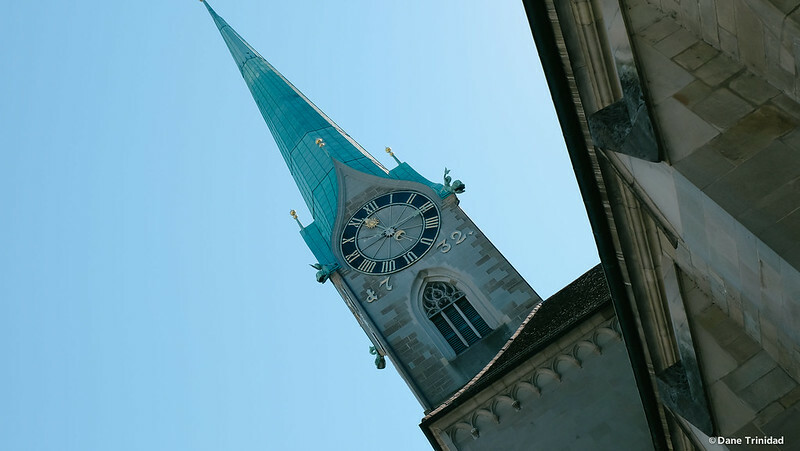 Based from my last minute research, Free Walk Zurich, conducts a daily Zurich city tour for tourists. The good thing is that there is no pre-registration needed- just show up in Paradeplatz by 11am and join the group. My tour group for Zurich city walk. 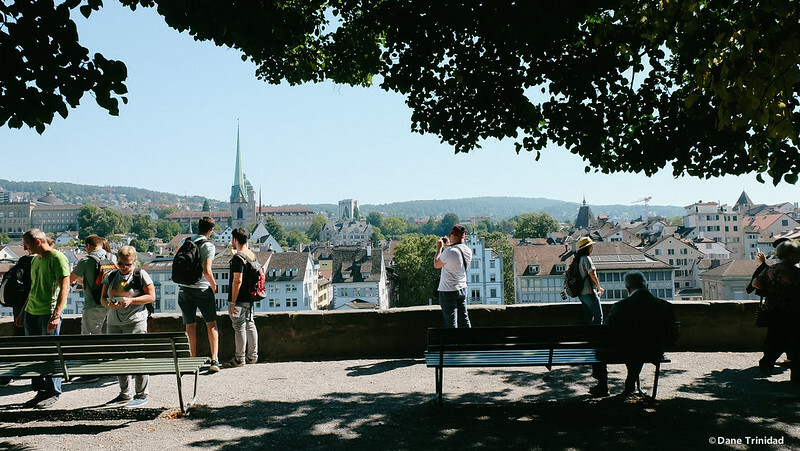 We went to nearly all of the city highlights of Zurich like Fraumünster, Lindenhof, Grossmünster, Niederdorf, and other hidden places of the city- everything for free. Of course in the end, you can give whatever amount you like as a form of gratitude. 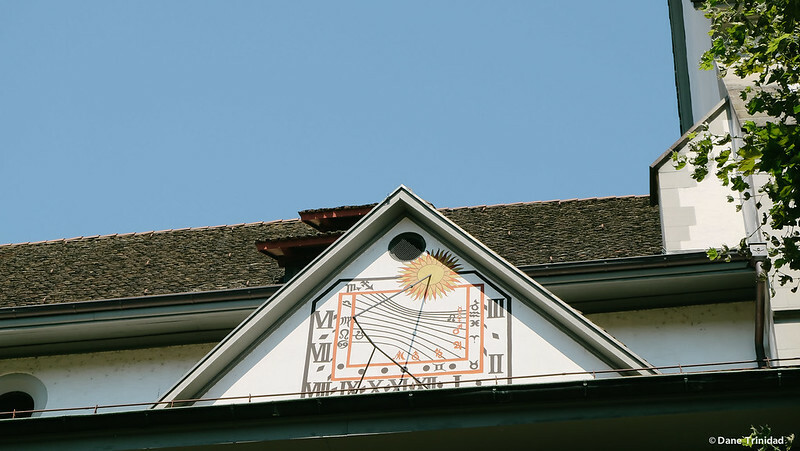 Personally, I was impressed with the coverage of this tour plus the details that the tour guide shared to us, so I highly recommend for you to try this out! 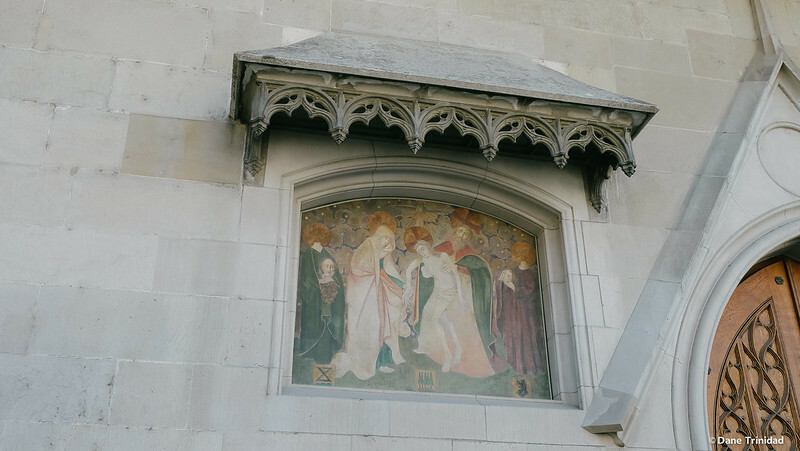 The controversial painting depicting the beheaded martyrs in Zurich who died for Christian beliefs during the Roman rule. After the tour, I checked-in, and then went back to the main bridge. 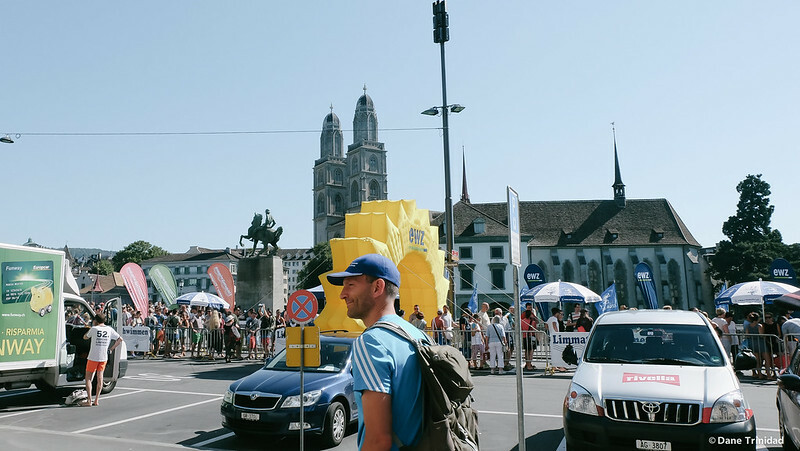 Fortunately there was a summer Zurich swim festival happening. Lots of people in swimwear, getting their floaters , jumping and swimming happily along the Zurich lake! Fun event to watch! 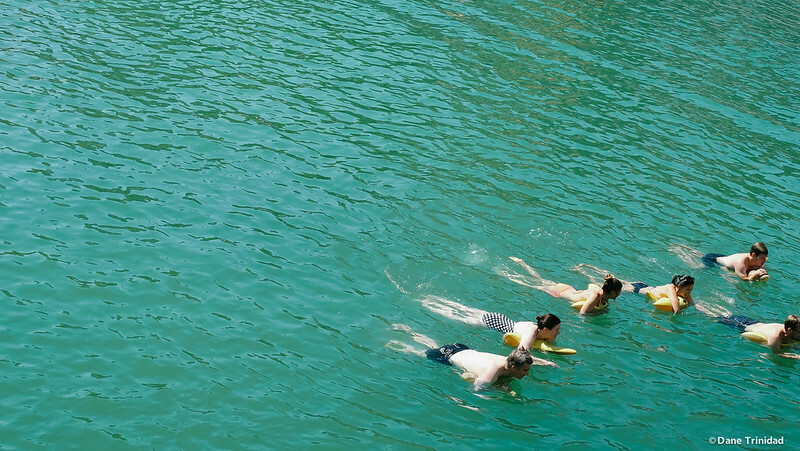 Summer fun in Zurich’s very clean waters! 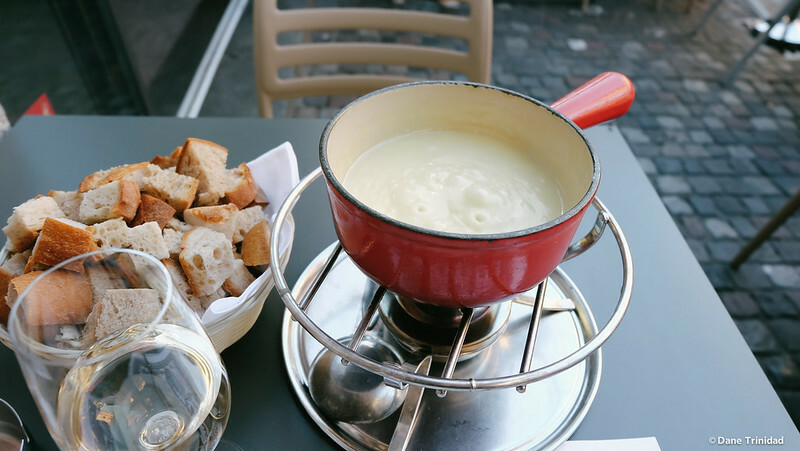 For my birthday dinner, I tried cheese fondue and wine in one of the top-rated restaurants in Zurich- Swiss Chuchi. The serving actually is too big since I’m eating alone, but at least I was able to try fondue in the land of cheese (though deep inside I was thinking that the Raclette would have been better). 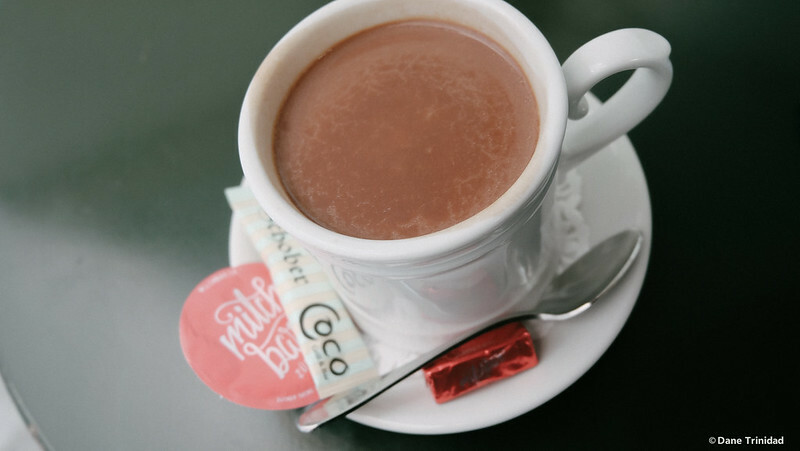 For dessert, I had a cup of hot chocolate in Cafe Schober. 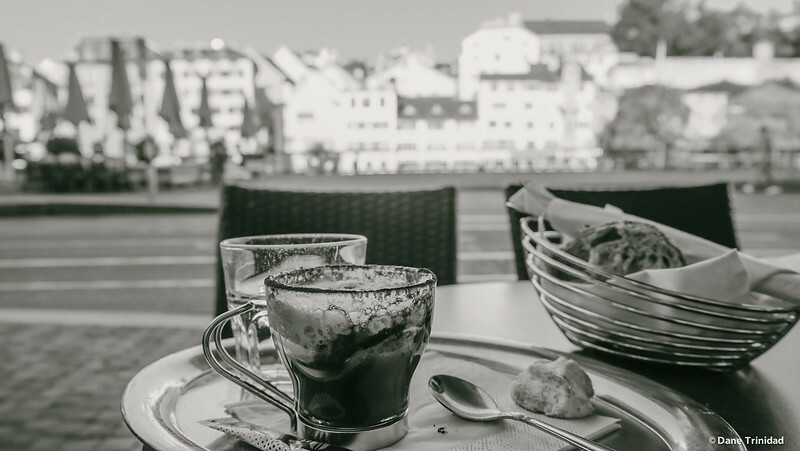 According to reviews, this is the best hot chocolate in Zurich. For me, it’s good but not that impressive. Better to try this out during winter! 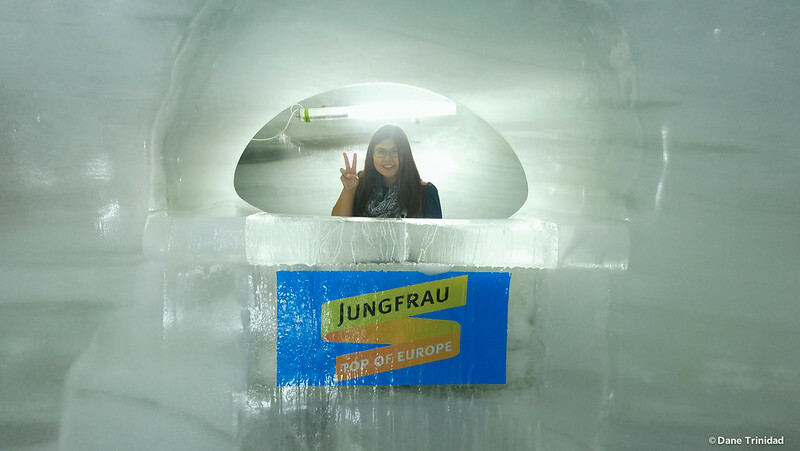 For my Day 2 (Sunday), I originally booked a trip to Interlaken, but after arriving in the tour booth, I was convinced to upgrade my tour to Jungfrau since a Switzerland trip is not complete without reaching the top of Europe! 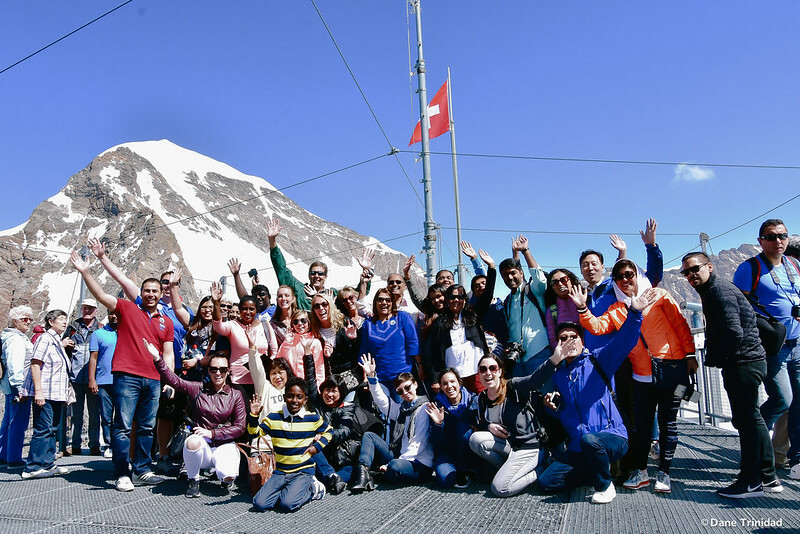 The whole travel time from Zurich to Jungfrau took around 3 hours (bus plus train). 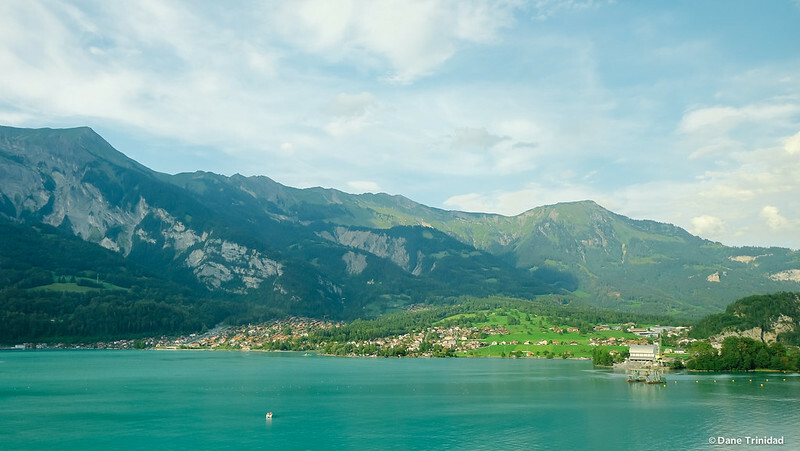 We stopped by shortly for 30 minutes in Interlaken, then went ahead to Jungfrau. Our tour guide is really expert with the place and the poses that you need to do per area. 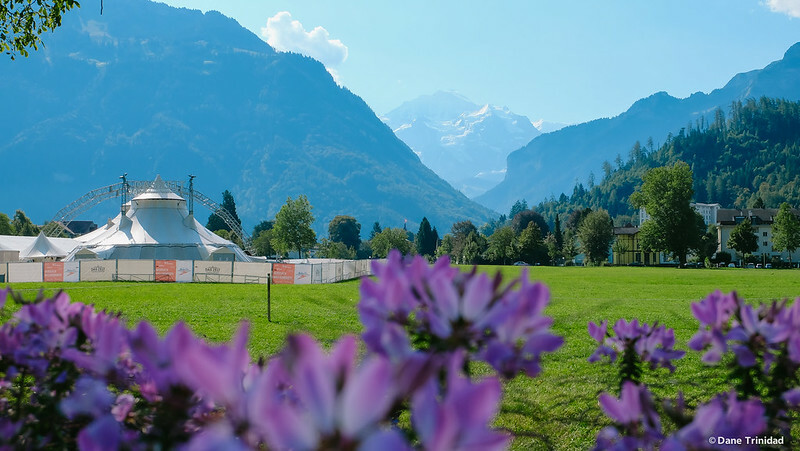 Jungfrau is the highest rail station in Europe and located 3,454 metres above sea level. 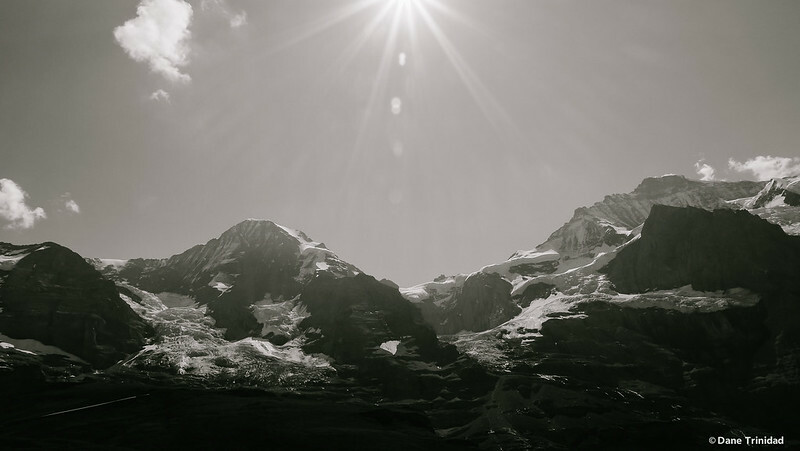 Because of the height, one might experience dizziness or shortness of breath upon reaching the top, so make sure to monitor yourself closely once you are here. Make sure to also bring a jacket going here. Even if it’s summer,t he temperature will still be cold and the surroundings will be full of snow. 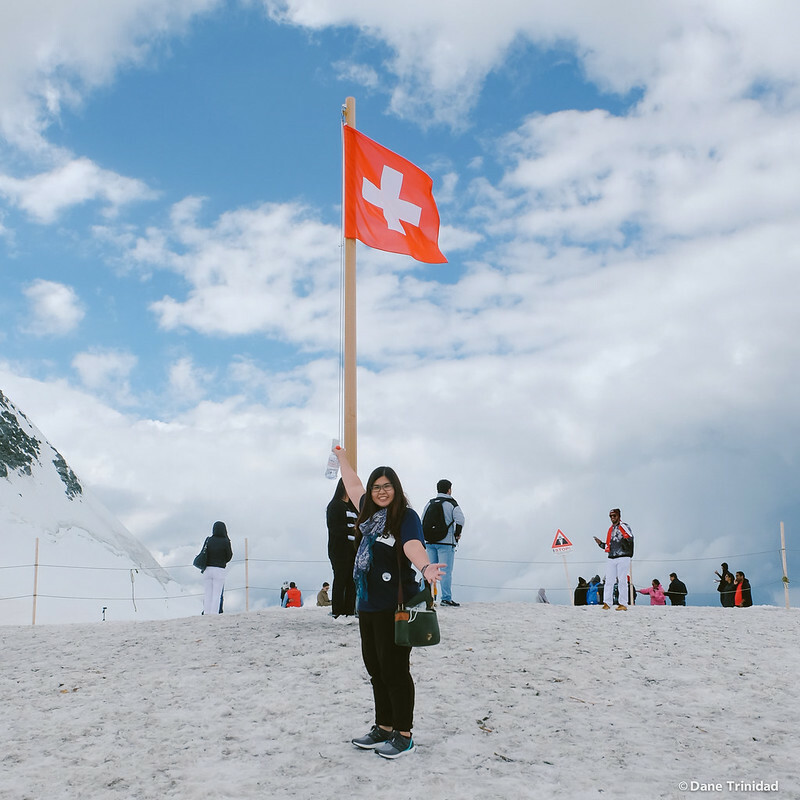 Yours truly with the Switzerland flag. Yes, I know I should have worn a jacket. 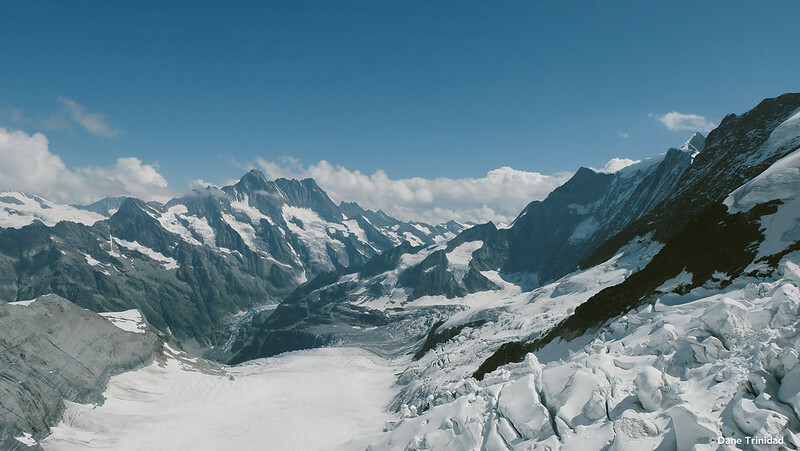 Super duper beautiful view of the snowy mountains of Switzerland! 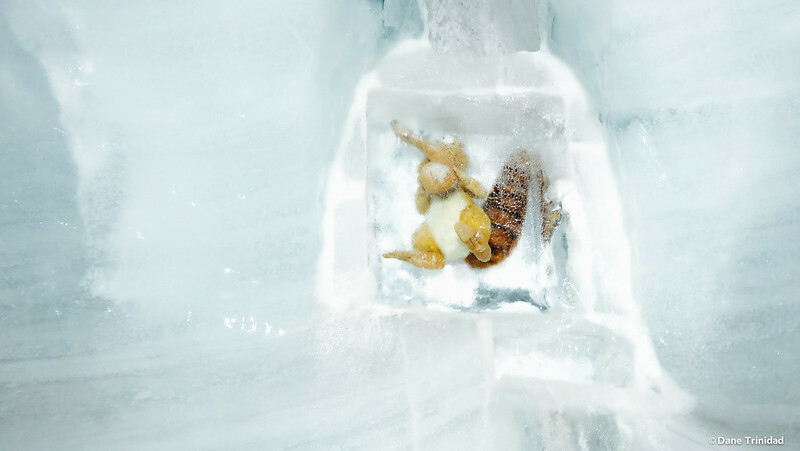 So… Scrat (from Ice Age) was trapped in Jungfrau’s ice! 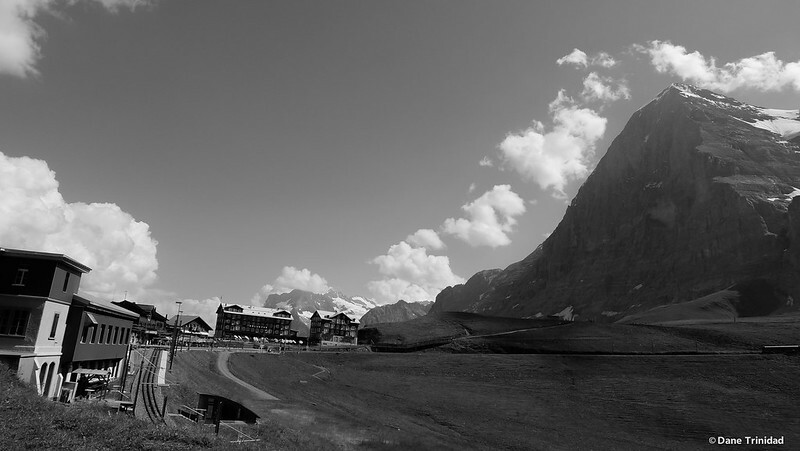 Overall, the whole Interlaken- Jungfrau-Grindelwald trip is so worth it. I met a lot of new friends during and the whole experience is just amazing. My next year’s birthday trip will definitely have a high baseline. That’s it! Watch out for my next trip in Europe!